The Pacsafe Venturesafe X30 Adventure Backpack is innovative Anti-theft Adventure Backpack integrates the best performance features such as a built-in rain cover, aluminum support back panel, stowaway hip belt and 15in MacBook® sleeve with the best of our anti-theft technologies to help ensure maximum protection and comfort. Unique technologies include, built-in eXomesh® Slashguards, smart zipper security, hard-to-cut Carrysafe® Slashguard Straps With Dyneema®, an RFIDsafe™ blocking pocket, as well as a dual release security buckle that allows you to attach your bag to a secure fixture to deter bag snatchers from running off with your bag. What's more, it's even been designed to seamlessly work with the new Travelsafe® X15 water-resistant portable safe insert. This 360° eXomesh® locking system can go inside the bag to act as complete wire-reinforced safe to help thwart the most persistent of bag slashers and it can also be padlocked to a secure fixture. The Pacsafe Venturesafe X30 Backpack-Black has many exciting features for users of all types. 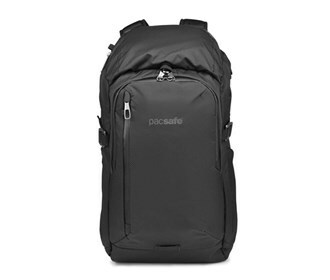 See the Pacsafe Venturesafe X30 Backpack-Black gallery images above for more product views. 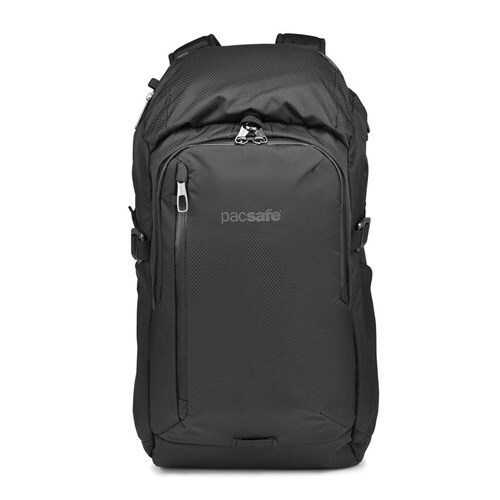 The Pacsafe Venturesafe X30 Backpack-Black is sold as a Brand New Unopened Item.